Despite the name this blog will talk much more just about the Digital World. First I will talk about what the Digital World is, its operating system and how it works. Then I'll talk more about how the Data System works in the Digimon franchise and its relationship with the Real World. I must make it clear that this blog will work more the basic structure of the Digital World so here I will not talk about regions like forests, caves and things like that of the Digital World unless they are a more accurate example of how the Digital World System works. In the future I intend to make blogs exploring more specific things, but at the moment this blog will just speak of the necessary. “ A World Different than Reality, The Digital World !! A huge world exists in a different dimension than the Reality in which human beings live. It is assumed that the all existence is reduced to data in this huge digital space. In any case, there has not been anyone who can see, profoundly, all the pieces, many of which are involved in mystery, of this existence. There are a variety of Digital Worlds that are full of life, though digital. They have an existence that transcends reality and sometimes even corrodes reality. Human technology has opened the door to another "Reality" that can not be measured and some people say that the human race has reached a turning point of destiny as a species. The Digital World has many explanations about its nature, although in the past many humans believed that the Digital World was part of our universe, it was confirmed that it is actually a world that exists independent of ours. Although the Digital World is easily explained as being the world within a computer, this existence is not a limitation for the Digital World in relation to the Real World. As explained in this Blog, Data is actually Universal constructs, that is, they are actually a Unit that contains particular constructs. In this way it can be said that in fact the Digital World includes the Real World and that the Digital World exists on a structural level above the Real World. Although it is not something 100% accurate (after all Digimon uses some terms as having a different meaning to be something with "good sound") the above image may be a good idea of what I will explain here. Imagine each computer as being an isolated universe, each containing its own information, own applications, and the like. These "Isolated Computers", or rather "Isolated Database," are what is called in the "Servers" Digimon franchise. Each servant is like an isolated world without any natural contact with one another. But still they are within a set that allows interassay between them, this is the "Network". As told in the pages of the Digimon franchise, "Digital World is a multi-server managed network", these servers that make up the Network are managed by Host Computer, which is the main computer that controls everything that happens on the Network. One of the first times where these "spaces" within the Digital World were presented was in Digimon Tamers, although possibly this was not developed to be valid in other works, it is undeniable that the Worlds presented in Tamers are basically the same thing as Servers, just before it was adopted directly by Bandai / WiZ and finally become something unified and used throughout the franchise. These other spaces are known to be other realms, other worlds that exist within the Digital World. Although these worlds seem close to each other, they are in completely separate bubbles. And although there are some instances of these worlds being able to communicate with each other, they are independent of each other and the connections are so rare that it is necessary to search for them to be able to cross the worlds. It is also said that there may be some mysterious law governing the crossing between the worlds, and the connection between them is so rare that many Digimon do not know that other worlds exist. Over time the use of other servers within the franchise has become more common. 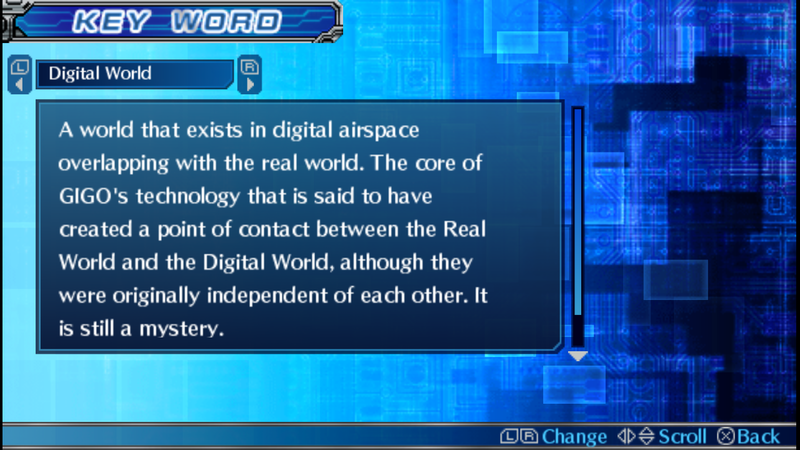 In Digimon World 3 and Digimon World X the story takes place right between Servers, and although a different Server is considered to be an outside world, they are still considered as part of the Digital World. A mechanic similar to that used in Tamers. 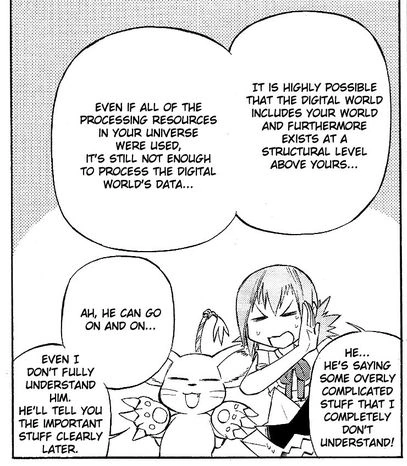 This type of concept was used again in Digimon Story where in the games Sunburst and Moonlight is mentioned that the world in which the game goes is actually only a Server. In fact, the game mentions that the Wi-Fi connection is actually connecting with other servers, which indicates that in fact each copy of the franchise's games occour in a Digital World Server. This fact has been mentioned previously in Digimon World X where a Digi-Elf mentions that the connection between copies of the game is connection between Servers. There are still other Servers known as "Training BOX" (「育成 BOX」), they are accessed by Addresses connected to each V-Pet that exists, each one is a Server that exists among the layers of the Digital World. These "Training Boxes" are normally isolated spaces that are used to train the Digimon through the "Digital Devices" used by humans. In addition in Digital Monsters Ver.S that works with the concepts of Digital Monster, a primitive type of "Digital Device", there are a place called "Cosmos" (コ ス モ) where we can see galaxies and several stars (Yes, even a simple Address for the Digital Device already contains several stars and galaxies). The Digital World is made up of countless Servers, each copy of a franchise game goes on a Server, there are several stories that happen in alternate timelines but that are still only part of the same Network. In quotations about an Infinite Multiverse in Cyber Sleuth, there are quotes regarding infinite variations of characters that exist on the same Network (Like Rina and Mirei who were from the world of Re: Digitize Decode, a Server that exists on the Yggdrasil Network) . And furthermore, researchers confirm that the Digital World is indeed an infinitely expansive world. In the Digimon franchise the idea of interacting Past, Present and Future was something that took time to occur. There were mentions of this in the Digimon profiles like Clockmon, but only in games like Brave Tamer was there a real adventure through the flow of time. At the time of the "Digital Monster: Pendulum X" there was the Storyline of the Digimon Chronicle which is defined as being "A record of the fight which runs and comes out between space-time”. During this Storyline the Digital World was about to collapse, the amount of Data that existed in the Digital World was too great for the Program that Rules the Digital World to continue to organize everything, the program is known as Profecy, to improve the optimization of the Digital World , Yggdrasil decides to create a New Digital World. The "NDW" is outside the host computer, and is a safe virtual experiment space without accumulating data in the host computer itself. This New Digital World is divided into Three Layers in a system known as "Chronicle Layer System" (「クロニクルレイヤーシステム」). This division into three layers are divisions of a timeline. The first layer is called as Ulud Terminal, the Past (「過去」), in which ancient species such as dinosaurs, whose ferocity have been aggravated by the X-Antibody, prosper. The second layer is Versandi Terminal, a endless world of intense battles where several new species appear. The third is Skuld Terminal, the Future (「未来」), which is composed of many species of artificial evolution. The three-layered "Chronicle Layer System" is designed to manage data efficiently according to the evolution situation of Digimon while measuring data distribution. Chapter Three: A New Digital World that is composed of three levels: the 'past', 'present', and 'future'! Chapter Seven: The world where ancient dinosaur Digimon, whose ferocity have been aggravated by the X-Antibody, reside! Chapter Eleven: In the world that rules over the "Present", new species continue to be born! Chapter Seventeen: This world of the 'Future' developed to include many artificial varieties of evolutions. These Terminals are literally separated between the space-time. To move through the space-time between the Terminals, which are described as different moments of the Digital World, you must move beyond the time itself. Beings like Alphamon, who performed this kind of feat to go to the Ulud Terminal, are described as having to transcend spacetime to accomplish this. This is a world where to moving between layers even time is transcended! And now, becoming Ultimate, they moves between space-time. Chapter Twenty: The heroes advance through space-time, putting their lives and the future on the line! Memorial Stelas, the terminals that continue to record everything in the island. A giant storage that records all data that flows on File Island, as well as the Digital World. It is the months and years that passed in the Digital World manifested as a stela. It is said that if someone can look inside of one of these, they can control the world's entire data flow, and at the moment the balance of this overwhelming data volume is disrupted, it'll receive an amount of data that normal life simply can't endure. The Memorial Stelas monitor the overwhelming possibilities and bottomless abyss of information as they stand inconspicuously in the corners of the Digital World. In the Digital World it can be said that Past, Present and Future exist "simultaneously" thanks to the space-time division of the timeline in Ulud, Versandi and Skuld. This would be a "time division" and the Servers would be a "spatial division", joining the two we can mention the Data Log Calculations. In the Digital World, the past never ceases to exist. All the time that has already occurred is accumulated in what is called "Memorial Stela" and in the future this data goes to the Binary Castle (At least in the Network of Yggdrasil, in the Network of Next 0rder the records are in what is called Server Tower) which is a Superspace where all Data is processed. In addition to containing information from the past, the Stela Memorial still "monitors" overwhelming possibilities and a bottomless pit of information. In Xros Wars it is revealed that the Digital World Host Computer is able to analyze and calculate the cause and effect relation of all Digital World Data (but not omniscient, because although this can observe all possibilities, it is very complicated to analyze each already existing data and find out with 100% of precision which of the possibilities will occur). And this is very important because in the Digital World the records are the history itself, and so the timeline is modified when the records are changed. However from the general perspective of what is considered Digital World, past, present and future exist simultaneously through an infinite amount of time. Now I'll give you a little opinion about what I said so far, this is for those who do not have much time to read everything that has been said so far, if you have read you can skip this part unless you really want to read everything from here and see how I "fit everything". . To get started you need to separate two types of Digital Worlds, the Servers and the Network as a whole. The Network is a data space that extends endlessly and is divided into countless servers that are worlds completely separated from each other (to the point that inhabitants of these worlds may end up unaware of the existence of other worlds). What makes it possible to differentiate Servers from different Networks are their Host Computer (which I will explain later in this blog). The Network as a whole is always managed by Host Computer, and it is the same on all servers in that network. (We can see this in Sunburst / Moonlight, World 3, World X, Digimon Chronicle, etc.). So if the Host Computer of a Digital World Server is Yggdrasil, then it shares the network with the other servers hosted by Yggdrasil (Basically it is a way of saying that it is the same Digital World, but it is not the same world). As explained, each server (which exists through the infinite Network) is a world of its own that has planets, stars, galaxies and can even be infinite in time and space. Servers may have completely different stories from each other, such as Savers and Next that run on different servers on the Yggdrasil Network, or very similar. I've already said that there are infinite variations of her and Rina in the story, and that they necessarily go to a server in Re: Digitize and Decode. In addition, each copy of the Digimon games actually goes on another server that belongs to the same Network (And this is rather something important, since the end of Sunburst and Moonlight can only be accessed if there is a connection between the different servers). There are also so-called Addresses that are servers located in different layers of the Digital World, are digital spaces where each V-Pet in the multiverse connects to these different Addresses and serves as a place to train the Artifical Digimon (Usually most of the Digital Monsters V-Pets presented are part of the Yggdrasil Network, but there are the Tamagochi and Magical Witchs that occur on a different Digital World Network). Moreover in the Digital World you also have an interesting idea about the flow of time. From the New Digital World it can be said that the Past (Ulud), Present (Versandi) and Future (Skuld) exist simultaneously. They exist through the Three Terminals separated through space-time (but still part of the same Digital World) composing the three-layered "Chronicle Layer System". Even so, each "Present" of the Digital World also contains all the "Past" and also analyzes each "Future" possibly (thus permitting to have infinite knowledge through the analysis of the Stela Memorials) thanks to things like the Memorial Stela. Even every moment of Time are, from the perspective of the Terminals, "Different Worlds", each moment of the Digital World is recorded in the Stela Memorial making every moment of the past still exist in the Present. In addition to the Past Records, each Stela Memorial also calculates an overwhelming amount of possibilities through a bottomless pit of information which allows to simulate the future itself. The Digital World can not be compared to a computer in the way that many people try to put (ie with a meaning of inferiority), but to think of the Digital World as a computer is simply the easiest way to understand how it works. The Program of a Computer is basically the instruction of how it will work, the computer does exactly what its programming says (the way it interprets). If the programming tells the Computer that it should turn off when the battery is at 5% then the computer will shut down, unless the programming determines that this is something that can be ignored by the user. If the Program determines that the system should be updated, then the system will be updated and often the user can not prevent it (something that happens with many Windows users ...), unless the user himself knows ways to modify this programming or finding loopholes, which an ordinary user should not know, to prevent this. Basically programming is a law, the computer will obey programming unless that programming changes, just as our universe obeys physical laws. The same goes for the Digital World. The Digital World follows a Programming, the old Digital World is said to be controlled by a program referred to as "Profecy" that can usually only be accessed by the Command Room located in the Home Server (The Server that is located in the center of all the others). The Digital World operates according to a programming language. If the programming language tells a place to have energy, then this place will have energy. The programming also defines how certain parts of the Digital World will act. A demonstration of this is seen in Episode 5 of Digimon Adventure in which Koushiro goes to the command center of a Factory and sees its programming code that says perfectly how it will act and even causes that it has "energy to do this" . As Koushiro explains, in the Digital World the programming makes real actions. This is because for the Digital World, information is power. As you may have understood, Programming is very much equivalent to the Laws of Physics. One thing that Digital Beings can do is change that programming. Programmers through a programming language are able to modify computers, this also occurs in Digimon where through the programming language many beings are capable of great feats. One of the most classic examples of this is the character Analogman, who in games like Digimon: Digital Card Battle manipulates the programming of the Digital World and literally controls everything. Some examples of this is that it prevents the Player from performing Save, prevents the player from moving freely, changes the draw system of the game to always get good cards, causes the player to take bad cards and others things. Other examples include Koushiro using a code to power Tentomon and causing him to evolve into Kabuterimon. The Programming Language can be divided into levels through its complexity. In the Digital World, Magic users actually use what is called Sorcery, which is a high-level programming language. Sorcery is usually divided into a "Four Elemental System" that control water, earth, fire, and wind. However there are still other systems like those that control light and ice. Some Digimon like Piccolomon, who is fluent in reciting magic, are able to perform even miracles using the advanced programming language. Some Digimon like Jokermon use Magic as a method of erasing beings from existence. DarKnightmon uses magic to create magic seals, he has already used it to seal the space-time hole created by Lilithmon that would destroy a Zone (He also tried using Magic to separate a DigiXros, but the power of Darkness XrosLoader - which as the Xros Loader is also based on magic - was too strong for the separation to occur) .Wizardmon can use magic for various purposes such as modifying how other beings see something (thus he can disguise Digimon humans), erase memories and even nullify spells (as he did to nullify Vandemon's seals and Lilymon's paralysis). There are still ancestral sorcery types that are known as Shinto, Onmyoudou and Shugendou. Beings like Doumon use this to create death-curses and illusions. Imagine the Digital World being a network formed of several Servers, in this case there must be a main server (In this case a Host Computer) which is what maintains the existence of this whole Network. Each Digital Network is governed by a Host Computer that manages everything in the Digital World. A Host Computer is the Digital World Managing System and determine the Laws of existence, but they are not just codes of conduct to be followed, but literally the programming by which the universe obeys. Host Computer has no universal opinions and so many may disagree on how to manage your Network. For example, Yggdrasil prefers to rule his Network by keeping order while performing his experiments, while Homeros rules his Network without concepts of Good and Evil, so all Digimon must exist according to their own individual intentions. Host Computer as Yggdrasil are known as "God of the Digital World" (DWの『神』 or デジタルワールドの神). Having the function of Host Computer everything that occurs in the Digital World is determined by the Laws of that divinity. For example, Barbamon (When he gained the powers of a Host Computer) distorted the Laws of the Digital World and thereby altered the cycle of reincarnation of the Digital World. In this way all beings who were Deleted from the Digital World, would remain deleted and would not be reborn, unless they were chosen by Barbamon. There are many entities known as Host Computers or that act similarly, I will leave to explain about them more directly in the future so that this blog does not get too disorganized. As always in Digimon having an idea of the corresponding in the area of computation helps to understand what something is, but expand that idea to cosmic levels and thus will have what it means in Digimon. As always in Digimon having an idea of the corresponding in the area of computation helps to understand what something is, but expand that idea to cosmic levels and thus will have what it means in Digimon. In Digimon the basic function of Firewall is to protect the Programming of the World and the use of Programming in the Network thus preventing the illegal use of the Network by beings known as Hackers, as in Hackers Memory where Firewall is what protects the Data of the EDEN avatars from being normally controlled by the Hackers. The Network is able to create "Agents" that contain part of their abilities, two well-known are Meramon and Birdramon (being that Meramon is able to use its flames coming from the Firewall to destroy virus). There is still Agnimon which is the very incarnation of the Firewall that protects the Network being thus a guardian deity. Complete combustion! It incinerates viruses with its burning fist!! The Wall of Fire has existed since the universe was made and since then its divine flames had never stopped protecting the Digital World, until through a program created by Datamon it was possible to stop it for a fraction of a second. It was originally protected by the Homeostasis Agents who managed a security program preventing the Firewall from being controlled and even after almost all Agents were destroyed the Firewall's security system still functioned to protect it. The existence of the Wall of Fire was something that was described in the "Digimon Book of Revelations," but many Digimon believed that her existence was only something symbolic rather than something real. The Wall of Fire separated the Digital World from the Dark Realm, the Dark Area, where there was the Concept of Non-Evolution known as Apocalymon. A different Firewall was created by Barbamon in Digimon Next. Using his powers he has created a Firewall around System World that destroys all who are enemies of Barbamon, whether they are inside or those outside. This Firewall is considered impregnable defense system and while its flames exist the castle is practically impenetrable. The Digimon powers RizeGreymon and MachGaogamon (Illegals, whose power can even overcome Ultimates) are useless because they are always nullified by the Firewall. Murmukusmon explains that the Firewall created by Barbamon was created by his enormous power of the dark, something that he can control. This is interesting to note because we know that Barbamon uses the Dark Area's evil energies in his attacks and that Murmukusmon is known to also command the flames of hell (That is the Dark Area) leading to eternal suffering even after death. This may indicate that the Firewall crafted by Barbamon is actually something that stems from the eternal flames of the Dark Area, which may explain it to be "inviolable" to most Digimon. According to Murmukusmon the concentrated power of this Firewall is able to erase Shou, and possibly the rest of the World System, 100 times and there would still be power for much more. As already shown through the "Chronicle Layers System" the time flow of the Digital World is very different from ours, and in fact it acts differently. Of course the time flow of the Digital World depends on the Speed of Processing of Time Data. Which means that the speed of the Digital World's time flow is not constant when compared to the Real World (which has a much simpler time flow). Sometimes this variation in the flow of time can be caused by great power like Apocalymon that distorted the space-time of the Digital World, almost destroying this world, causing the flow of time in it to be faster than in the Real World. Sometimes the Digital World itself has regions where the flow of time is faster in one place than in another. Places like Ancient Dino have the characteristics of time flowing at different speeds, in the "Glacial Time Zone" the flow of time is slower than in the rest of the Digital World while in the "Speedy Time Zone" the flow of time is much faster. Clockmon is naturally known as the space-time administrator of all Networks, at least until 1999, being one of those responsible for making the time move (This explains why in some games, the clock we see is Clockmon itself). Alternatively things like the "Rapid Time Switch" and the "Calm Time Switch" are able to change the time flow of the Digital World making it go faster or slower. In addition, the time axis of the Real World and the Digital World itself (Considering only the Real Real, remember that the Real Realm exists within the Digital Realm) are different. While the Real World has a linear time axis, the Digital World has a non-linear warped time axis (The time axis of the Real World resembles a line, while that of the Digital World resembles an elliptical curve). Being straightforward, the Digital World (and the Digimon) and the Real World (also known as the physical world) should not interact. The explanation of this ended up varying through the ages of the Franchise, but the most current explanation is because of a variation in the Structure of the Two Worlds. Both the Digital World and the Real World originated in the Quantum Sea, being that they originally were parallel worlds. However one difference made this change, the Core Grammar that governs the Digital World and the Core Grammar that governs the Real World have become different. With that difference Human and Digimon should not interact, the Digital World is very different from the Real World. It is a world where the laws of physics do not exist, magic (Programming Power) is something common, and biological theories are simply ignored. In fact, the interaction between the Digital World and the Real World is something that should not occur, they are not connected. However from time to time a connection is established and this allows the interaction between these two worlds. Now I will explain how this can occur. Briefly, refers to converting the Real Substance into Digital Data. However, in the real world, even a small object, the amount of information is overwhelming and does not fit in the frame of any existing storage device. What was proposed as a solution was the "Artificial Digitize Phenomenon". It transfers real-world data with overwhelming amounts of information to the Digital World, which has a capacity of overwhelming amounts of information. The prospect of the commercialization of this technology was considered only, for the first time, when the existence of "Digital World", that existed beside the Reality as another world rather than artificial storage, is confirmed. However, at present, it is successful only in the form of the old data format and the experiment itself of exchanging real-world materials with the digital world is still not successful. The biggest advantage in the study of the phenomenon is the corporate conglomerate which invited the team by the authority of quantum physics and information engineering from Russia to the GIGO company. Everything that exists in our world can be summarized in Digital World Data. The Digitizing process, called Digitize, is the process in which Substances from the Real World become Data that exists in the Digital World. Human beings when transformed into Data are recognized as Cyber Entity, a digital existence similar to the Digimon. Consequences of a Human turning into a Digital Existence include immortality (will never age), will no longer have physical needs (no more need to eat, sleep, etc.) and also physical limitations (like diseases) will cease to exist. It refers to bringing back Real World Begins that have transfered to the Digital World, though information digitized by the Digitize Phenomenon, to the Real World again. The Digitize Phenomenon and the Re:Digitize phenomenon should be used as a pair together, but the experiments haven’t reported, yet, a successful example, and there are too few ones that belive in a practical application. The Re: Digitize has the opposite function to the Digitize, being the Re: Digitize the process of when something from the Digital World is sent to the Real World, the Reality. Quantum teleportation is a process by which quantum information (e.g. the exact state of an atom or photon) can be transmitted (exactly, in principle) from one location to another, with the help of classical communication and previously shared quantum entanglement between the sending and receiving location. It is in this way that the transformation into Data and Real Substance have been explained in Digimon Tamers. The "Real" form is converted into information and sent to another world. When something moves from the Real World to the Digital World is known as Metaphorize (メタファライズ), in the case of the Digital World, Information (Data) is already something in this world and therefore after something is reduced to Data, nothing else has to be done. But with respect to the passage from the Digital World to the Real World, the information coming from the Digital World remains only as a form of energy, and it is necessary to perform Energy conversions for something physical. The process of transforming Digital Information Energy into Real Substances is known as Realize (リアリゼーション). When Digimon come to the Real World through Realization, some sort of fog-like particles appear. These particles are a pattern that occour during the Realization process, when a Digimon materializes from the Digital World/Network. This fog acts on certain electromagnetic waves that encompass the Real World, and follow the Digimon data, rapidly condensing the particles in the ar through chemical reactions to produce a pseudo-protein. Once that pseudo-protein stabilizes, a Digimon obtains a physical body in the Real World. However, its molecular composition is highly unstable and fragile.